Britain's fine dining scene owes a lot to the Roux family or (dare I say) dynasty. For almost 50 years now, the Roux family have been a key contributor to gastronomy in Britain, first and foremost as patrons and chefs of two of the oldest and most distinguished Michelin starred restaurants in Britain. It all started in 1967, when brothers Albert and Michel Roux opened Le Gavroche in Lower Sloan Street in London, a restaurant that dramatically changed the London dining scene. Le Gavroche was awarded its first star in Britain's inaugural Michelin guide in 1974, a second star followed in 1977 and in 1982 Le Gavroche was the first restaurant in Britain to obtain three Michelin stars. By then Le Gavroche had moved to its current premises in Upper Brook Street in Mayfair. 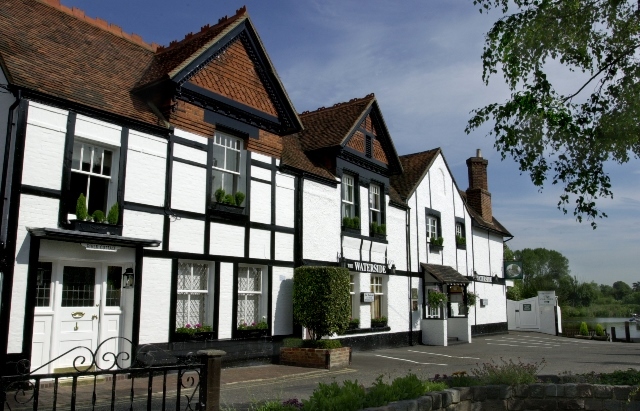 The Roux family's other restaurant is The Waterside Inn in Bray-on-Thames, a restaurant that opened in 1972. Head chef at the time was Le Gavroche alumnus Pierre Koffmann. The Waterside Inn too, was awarded its first Michelin star in the 1974 Michelin guide. The second star came in 1977 (too) and in 1985 Michelin bestowed its highest rating, three Michelins stars. It is an accolade the restaurant has held ever since, making it one of longest running three-star restaurants outside of France. As the Waterside Inn's name suggests, the restaurant is not only known for its three-star status, but also for the magnificent waterside location on the banks of the river Thames. The older generation is no longer actively involved as chefs at Le Gavroche or at The Waterside Inn. Albert Roux (b. 1935) retired as executive chef of Le Gavroche in 1993, after which his son Michel Roux jr. (b. 1960) took over. The restaurant lost its third star in 1993 guide and has held two Michelin stars ever since. Michel Roux sr. (b. 1941) handed over the reigns of The Waterside Inn to his son Alain Roux (b.1968) in 2002. The Waterside Inn is open for lunch and dinner Wednesday through Sunday. The restaurant offers an a la carte menu (starters £35 - £60, mains £53 - £72.50, desserts £31.50 - £41), a Menu Gastronomique (2 courses £49.50, 3 courses £62.00), and a Menu Exceptionnel (6 courses £160.00). I had lunch with my husband at The Waterside Inn on Thursday 14 July 2016 and we both ordered the Menu Exceptionnel. 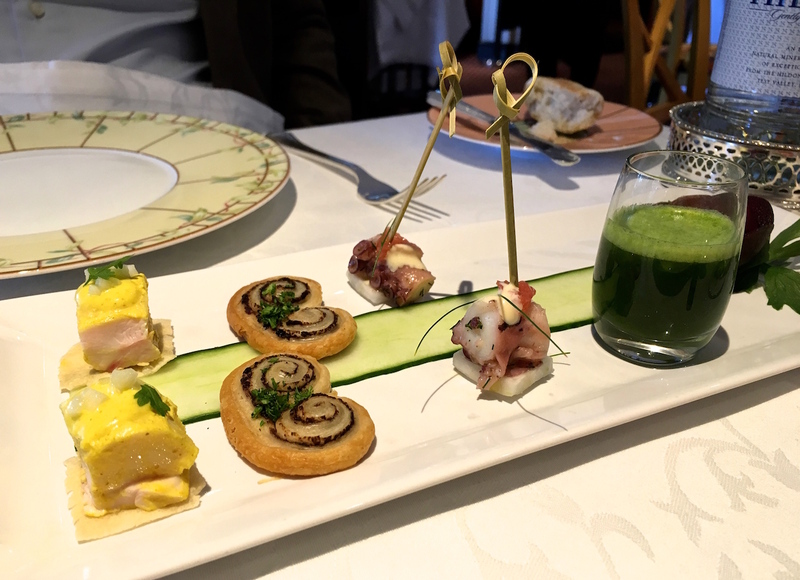 Lunch started with four canapes: green gazpacho flavoured with rocket leaves and a touch of gin, grilled octopus, fennel and grapefruit on a skewer, a black olive palmier, and a piece of curried chicken served on a thin cracker. Flavourwise four nice canapés, especially the green gazpacho, which had nice and peppery rocket flavours, but presentation-wise it was uninspired and poor. 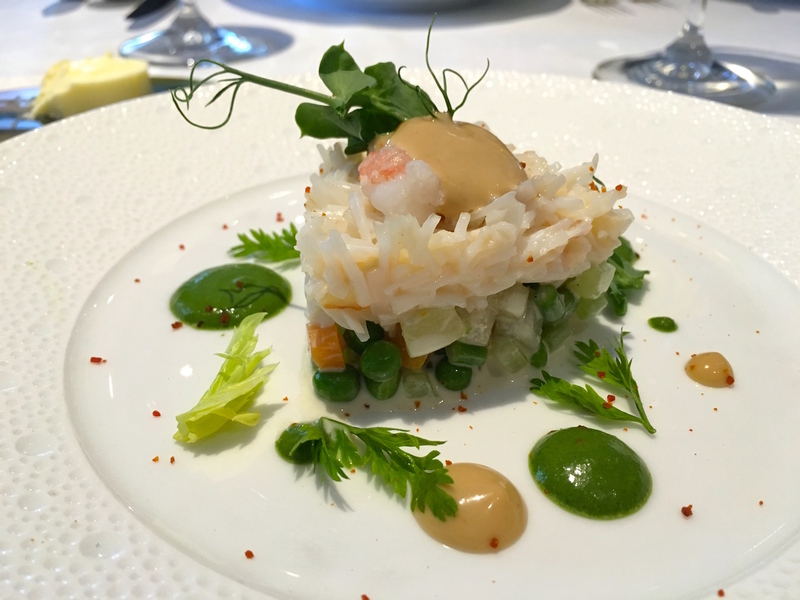 The first course of the Menu Exceptionnel was a triangle-shaped tower of freshly picked and lightly mayonnaised white Devon crab meat, topped with a (very) tiny langoustine and served on a salad "Macédoine", a mixture of (chopped) vegetables such as peas, carrot, purple potato, celery, and green beans, all cooked with a little crunch, and coated with an elegant mayonnaise dressing. Also on the plate were a few large dots of concentrated lovage and cocktail sauce. A lovely dish with nice and fresh flavours, the Macédoine salad being a nice companion for the crab. Both sauces were quite intense but did not overpower the other ingredients. 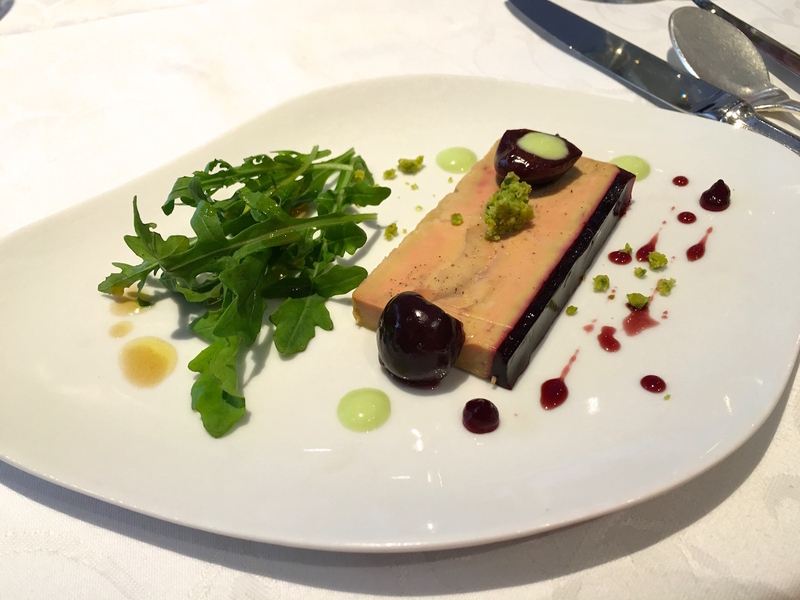 Second course was a slice of a well-made foie gras and cherry terrine, accompanied by some marinated cherries, pistachio streusel, pistachio sauce, and rocket leaves, served with some brioche on the side. A nice and classic combination, but the execution lacked refinement. The pistachio sauce was too strong for my liking and I was surprised to see a brasserie-style rocket leave garnish on the plate. 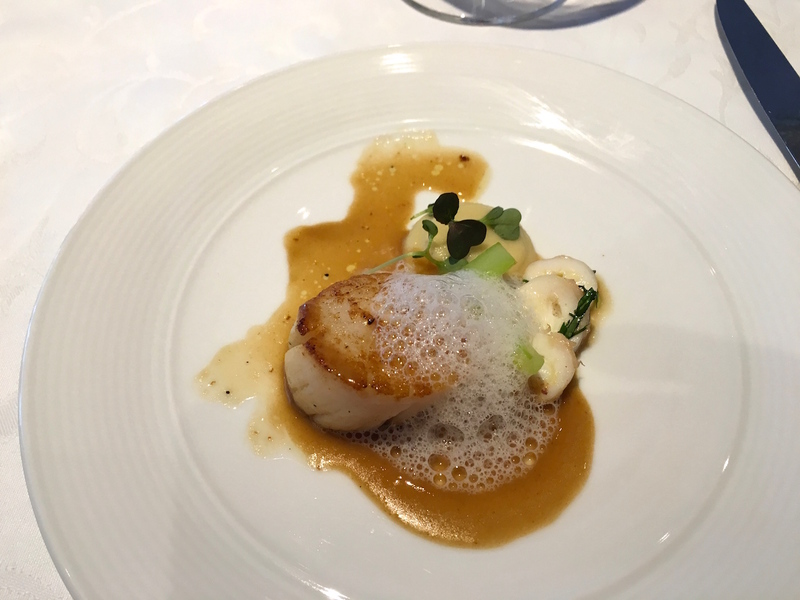 This was followed by pan-fried sweet and succulent scallop served with a smooth fennel puree, three slices of tender octopus seasoned with coriander, and finished with tamarind sauce and a coconut foam. Sloppy presentation, but otherwise a good dish with a nice tangy sharpness coming from the tamarind sauce and some characteristic mild and sweet notes from the coconut. 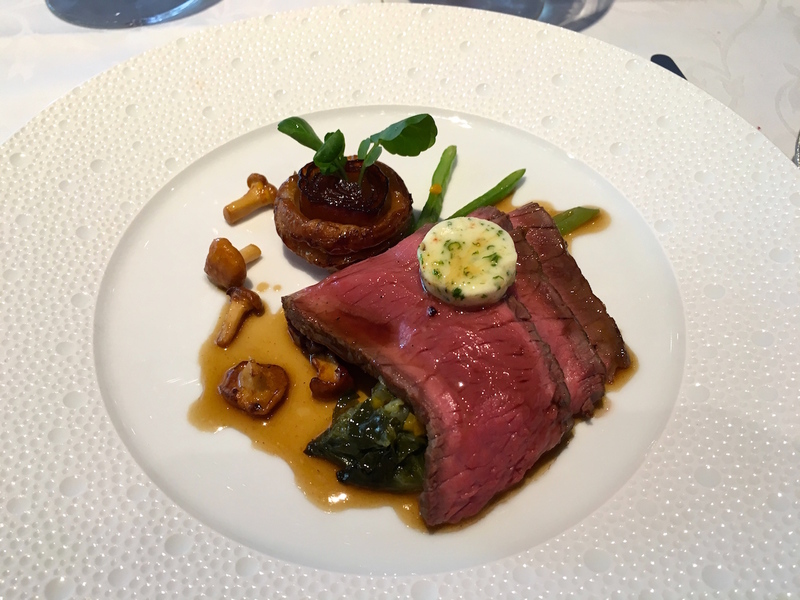 Main course in the Menu Exceptionnel was Angus beef, served with a small disc of herb butter, carmelised shallot tatin, girolles, soft braised lettuce, green beans, and a "savoury scented jus". Overall a nice plate of food to eat with beautifully cooked beef (with generously served seconds) and a tasty shallot tatin, but the missing ingredients here were elegance and finesse. I appreciate classical flavours, but this is just not the kind of main course you would expect in a Menu Exceptionnel in a three-star restaurant. 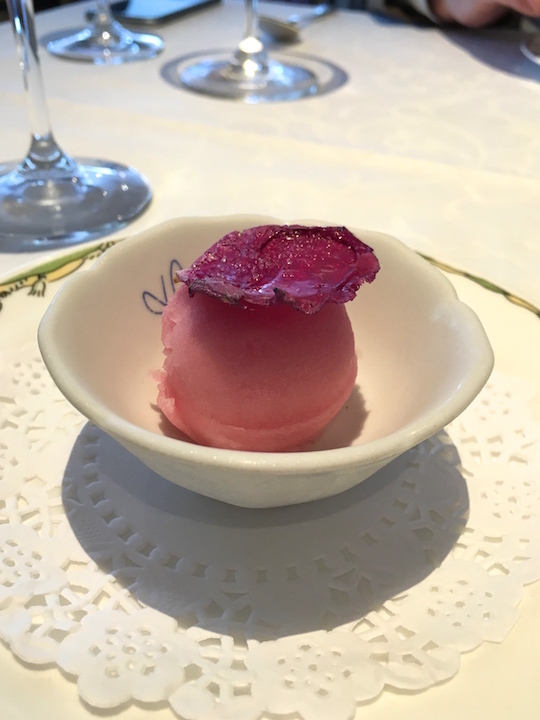 The meal continued with a rose sorbet palate cleanser, which was followed by a cheese course. The first of the two desserts was a simple but pleasant combination of apricot and almond cake served with a rosemary-flavoured apricot sorbet. 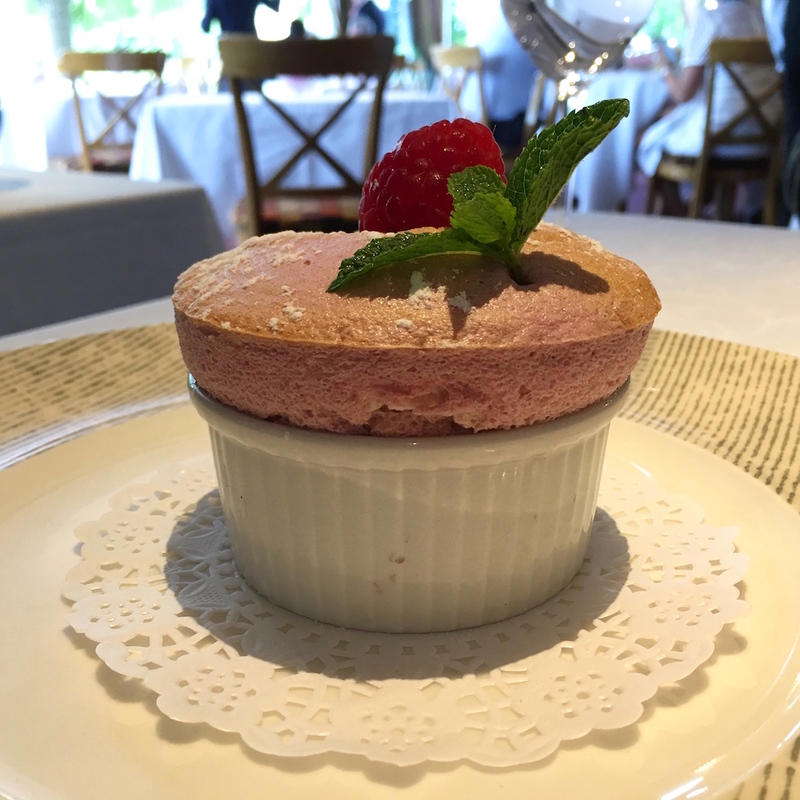 This was followed by a straightforward, but perfectly cooked fluffy raspberry soufflé, nicely paired with some raspberry coulis. It is with a heavy heart that I come to the conclusion of this review. When restaurants have had three stars for a long time, sometimes their glory fades, and their dishes lose their edge and become old-fashioned, as the chef's inspiration slowly wanes. This is not the case here however - Alain Roux took over from his father many years ago, to continue the tradition of the Roux dynasty at the Waterside Inn. Here alas, the situation is far worse. This meal was not even a serious attempt to provide the diner with a gastronomic experience that could remotely be regarded as worthy of three Michelin stars. It was a decent meal, a good meal even. 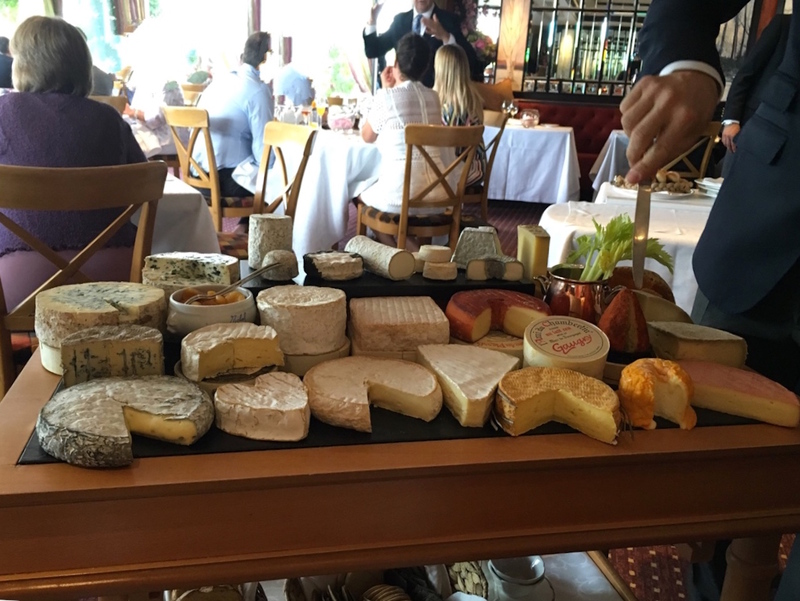 Had it been served to me in an upscale brasserie, I would have been very pleased. In the context however, of a restaurant that is supposed to be "worth the journey", the dishes conspicuously lacked complexity and finesse, both in the flavours and in the presentation. There is nothing wrong with the quality of the ingredients or with the skills of the kitchen team, but the food which arrived on my plate completely lacked imagination and inspiration. There may be dishes on the menu that still hint at the restaurant's former glory, but there was certainly nothing exceptional about my "Menu Exceptionnel" - except for the price tag. This was so far off the mark, that you wonder whether they are even trying.